Nestled in the heart of quiet farmland between pine trees and fields, our Holy Dormition of the Theotokos Memorial Chapel is a peaceful place conducive to meditation and prayer. Coming out of the city to attend the Divine Services one finds the tranquility to recharge our spiritual batteries and leave behind the hectic pace of our daily lives. In Orthodox Christian piety, Mary, as the Theotokos (Mother of God), is honored as the Panagia or All Holy who is the supreme example of the cooperation of between God and Man, as God, Who always respects human freedom, did not become incarnate without the free consent of the Virgin. The Holy Scripture tells us, her agreement was freely given: Behold, I am the handmaid of the Lord; let it be to me according to your word (Luke 1:38). The Feast of the Dormition (Koimisis) of our Most Holy Lady, the Theotokos and Ever-Virgin Mary is celebrated on August 15 each year. The feast commemorates the repose (dormition, and in Greek, koimisis) or "falling asleep" of the Mother of Jesus Christ, our Lord. The feast also commemorates the translation or assumption into heaven of the body of the Theotokos. The Holy Scriptures tell us that when our Lord was dying on the Cross, He saw His mother and His disciple John and said to the Virgin Mary, "Woman, behold your son!" and to John, "Behold your mother!" (John 19:25-27). From that hour the Apostle took care of the Theotokos in his own home. Along with the biblical reference in Acts 1:14 that confirms that the Virgin Mary was with the Holy Apostles on the day of Pentecost, the tradition of the Church holds that she remained in Apostle John's home. At the time of her death, the disciples of our Lord who were preaching throughout the world returned to Jerusalem to see the Theotokos. All of them, except Thomas, were gathered at her bedside. At the moment of her death, Jesus Christ Himself descended and carried her soul into heaven. Following her repose, the body of the Theotokos was taken in procession and laid in a tomb near the Garden of Gethsemane. When the Apostle Thomas arrived three days after her repose and desired to see her body, the tomb was found to be empty. The bodily assumption of the Theotokos was confirmed by the message of an angel and by her appearance to the Apostles. The Feast of the Holy Dormition (Koimisis) of the Theotokos is preceded by a two week fast, referred to as the August Fast. From August 1st to August 14th (inclusive) Orthodox Christians fast from red meat, poultry, meat products, dairy products (eggs and milk products), fish, olive oil, and wine. The August Fast is a stricter fast than either the Holy Nativity Fast or the Holy Apostles Fast, with only wine and oil (but not fish) allowed on weekends. Almost every evening Orthodox Christian faithful assemble at their local church to honor, entreat and pray to the Ever-Virgin Mary and Mother of God to intercede for them to her Son and God for His forgiveness, for healing both soul and body and for their salvation. This divine service is called "Paraklesis" or "Supplication" service to the Theotokos. Orthodox Christians submit the names of the living members of their families to the priest to be mentioned at the service, entreating the Mother of God to bless their loved ones with good health and protection from the evil one. On the eve of the Holy Dormition the priest conducts the holy service of Great Vespers, followed by the Blessing of the Five Loaves of Bread and the holy service of the Epitaphios of the Theotokos. The Epitaphios of the Mother of God, a richly embroidered cloth icon portraying her lying in a state of sleep, is used together with specially composed hymns of Lamentations which are chanted with Psalm 116. The Evlogitaria hymns for the Dormition are chanted, echoing the Evlogitaria of the Resurrection chanted at Othros (Matins) on Sundays throughout the year as well as on Lazarus Saturday and Great and Holy Saturday. The Epitaphios is solemnly carried in procession around the Chapel while all the faithful carry a lit candle. Upon the return of the Epitaphios to the Chapel, the faithful are invited to venerate Panagias' holy Epitaphion icon with faith, reverence and profound humility. At the conclusion of the Divine Liturgy on the Sunday following the feast-day of the Holy Dormition Feast each year, the parish of Saint Andrew of South Bend, Indiana, holds the Annual Feast-Day Picnic on the grounds. It is a time of rejoicing, dancing traditional Greek dances, eating good food and spending the day together, not only as fellow-parishioners, but as brothers and sisters in Christ. 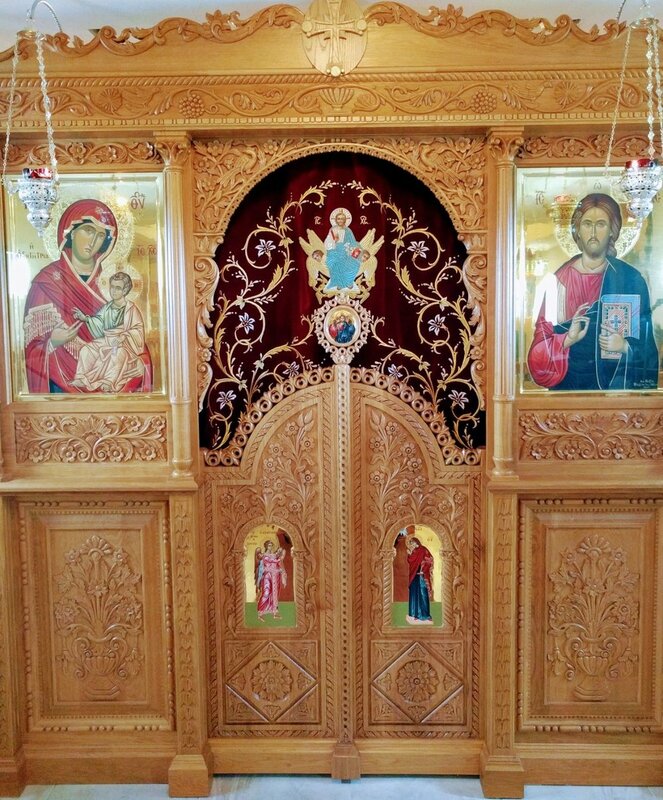 Priests serving the parish have encouraged the parishioners to preserve the Chapel and support the various Orthodox services that have taken place there. Over the years the Chapel has been used to celebrate the Feastday of the Holy Dormition (August 15), for altar boy retreats, youth summer camps, weddings and baptisms. Trees that the children of our parish planted many years ago still stand today. Since 2000, under the guidance of Father George Konstantopoulos, the chapel (which had fallen into disuse) was revived, services become more frequent and attendance increased again. Thanks to the love, generosity and commitment of our parishioners and the capable leadership of our building committee chairman, Mr. Nick Giannakakis, we have been blessed to be able to enlarge the Chapel. Originally it held approximately 30 people; it now accommodates 80 along with kitchen and restroom facilities. Our plans for the near future, by the Grace of God and with the intercessions of the Panagia, include furnishing the Chapel, adding a paved path for religious processions, a driveway, landscaping, a new sign at the road and a Cross on the roof.